A seven-member delegation from Nagaland, including Explore Nagaland's Nino Zhasa, visited Myanmar to attend a two-day investment conclave at Monywa. Explore Nagaland used the invitation as an opportunity to check out the tourism possibilities by testing the infrastructure such roads, hotels and transport from Kohima, Nagaland to the Sagaing region of Myanmar and then on from there to Mandalay. If you think you might like to visit Myanmar contact Explore Nagaland. Our journey started from Imphal so I travelled by local bus from Kohima along the road made famous by the WW2 battle of Kohima - Imphal. All delegates met at Hotel Classic, Imphal. 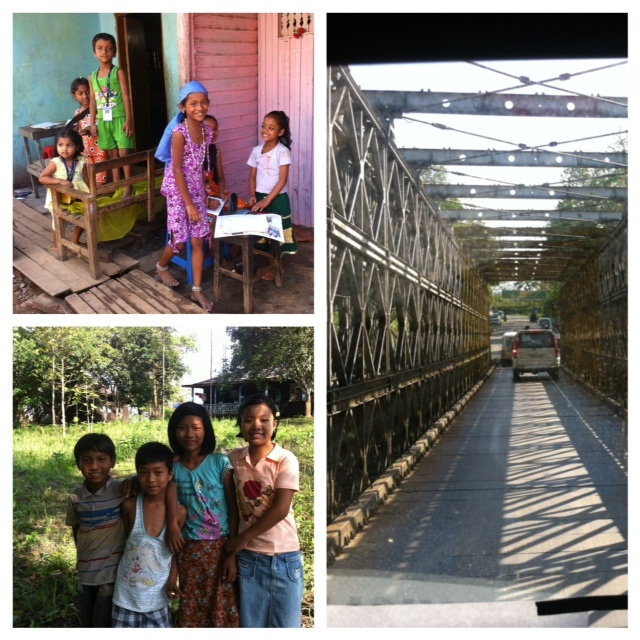 Our drive from Imphal to Moreh was 110kms/3hrs. We stopped for lunch at Moreh and waited at the border checkpost for verification of paper/documents. Thereafter we drove to Tamu across the bridge. We submitted our passports at the immigration office and were issued our inner-line permit for Myanmar to Mandalay began. A few delegates from Kolkata who had their Myanmar visas with them travelled with us. Their passports were cleared and returned to them. The bus for the delegates arranged by the Union of Myanmar, Border Trade Chambers of Commerce Tamu, drove us to Kalay which was a 3hr drive and 132 kms away. Our stay for the night was arranged at HotelShing Hong, we went out to a road side cafe for some Myanmar Beer and some local snacks after which we went to a restaurant for the local cuisine arranged by Umbtcc( union of Myanmar border trade chambers of commerce) Tamu, later we went to the hotel and rested for the night. After a good night’s sleep and an early breakfast we started our bus journey toKalewa city which was 40kms (1hr) to the Chinwin River where we boarded a steamer and then proceeded onward to Monywa Waterway 235Kms (10hrs journey). We had packed lunch on deck and had a jovial time taking pictures, noting pagodas (Buddhist temples) and little villages on the banks of the river. 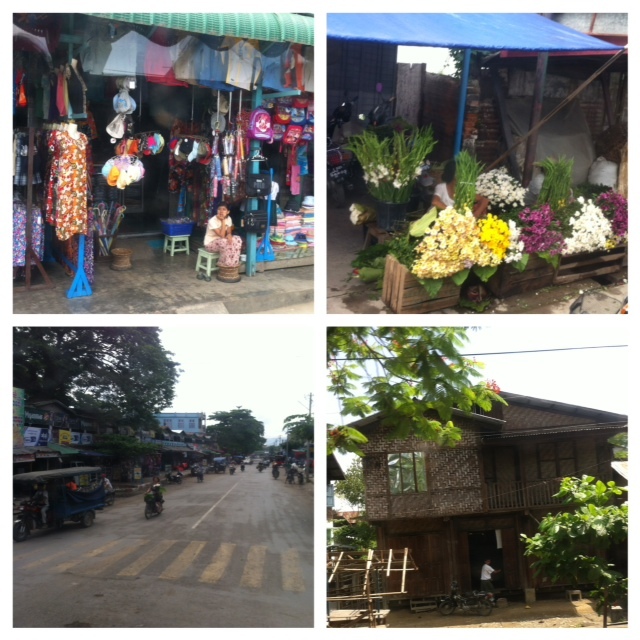 We stopped for tea in a town calledKani, bought beers and fruits for the rest of the journey. We reached Monywa at about 7:30 pm and as we docked, the bus was waiting to take us to our hotel Monywa where we were to stay for 2 days/nights. The function for the India - Myanmar Trade Fair was inaugurated by the Chief Minister of Manipur and the Chief Minister of Sagaing region of Myanmar. Thereafter we went to attend the seminar and conference, where presentations by both the delegates of the two countries and meeting and networking took place, after which lunch was served. In the evening we were entertained with cultural presentations followed by dinner hosted by the Chief Minister of the Sagaing region. We attended Business to Business meetings after breakfast. We met with the Chairman of the Naga Self-Administered Zone and talked about the possibility of rural tourism in their area. We were invited to their Naga New Year Festival which is celebrated annually on 15th January. We met local weavers and visited their village, where they were engaged in handling and weaving. It was interesting to know that their raw materials are from Coimbatore in South India. Along with us came a Textile Engineer who explained the know-how about the different weaves and raw materials imported from China and India. We learned that the designs come from the North Eastern State of Mizoram and the ready-made garments are taken to sell. 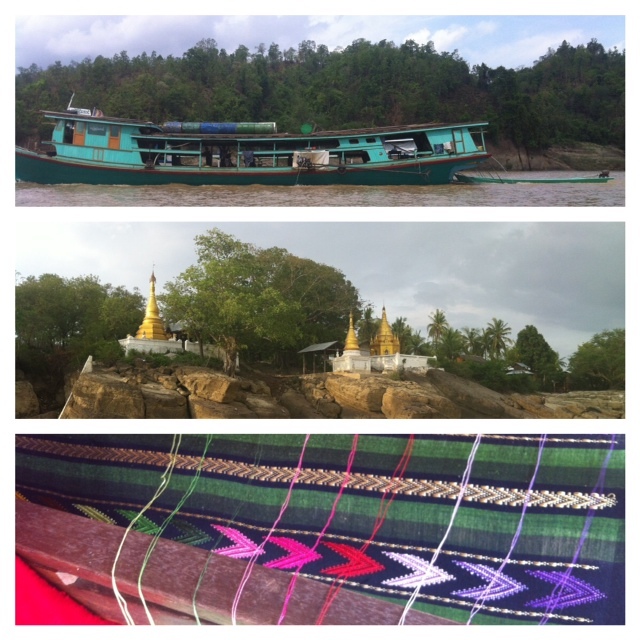 The locals also explained that there is a demand for Naga loin loom wrap skirts and shawls in Myanmar although they are expensive as they are made differently, therefore chances are that there is a market to sell/export Naga made shawls/skirts. It was a good shopping experience. 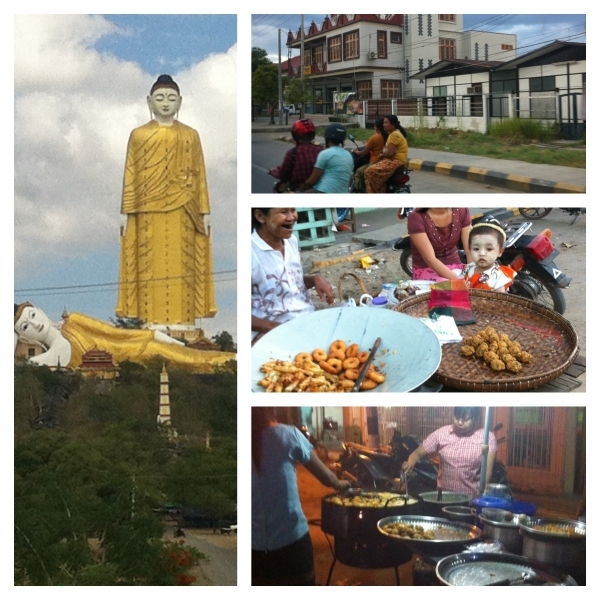 On the way we did interesting sightseeing of Buddhist temples (pagodas) and statues of Lord Buddha. 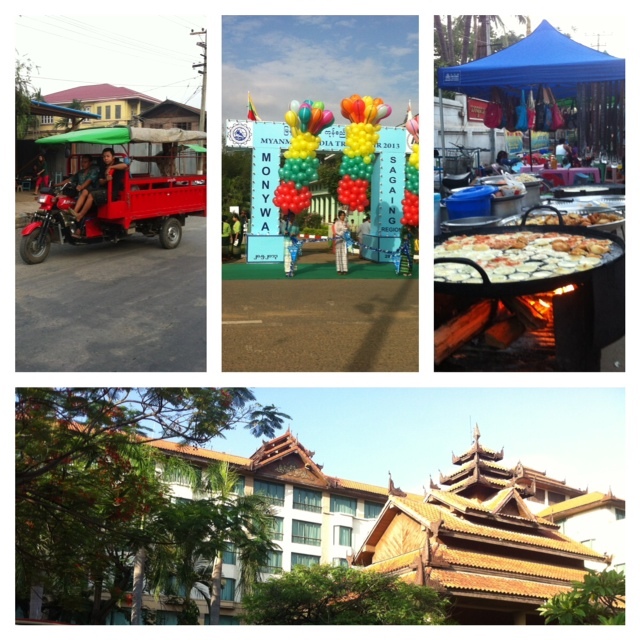 We reached Mandalay and went straight to our meeting at Hotel Mandalay hosted by the Chief Minister of Mandalay. After the formal meetings and presentation we had lunch and left for the day.Our evening was at leisure; sightseeing and shopping. The day was relaxing, we did some touring, visited a silk shop, some Manipuri villages and went back to the hotel. Our hosts took us out for dinner and a midnight safari for more exploring, to the wooden Bridge and the Mandalay Buddhist temple up on the hill. It was amazing to see the whole city at night and the temple looked breath-taking with the golden lights in the dark night, the way up the hill to the temple was marvellous too. We saw the midnight bazaar where locals were busy in the wholesale of vegetables and flowers. The day started very early for a chartered flight to take all the delegates for the return journey from Mandalay to Kalemyo, which took us 45min. A bus was waiting to take all the delegates back to Tamu from the airport (kms/hrs). At Tamu, we went back to the Immigration Office and collected our passports and we were dropped to Moreh, where we had lunch and hired a taxi for our return journey to Imphal and then onwards back to Kohima. Posted in myanmar, news, Travel, Uncategorised.